When I saw this pop up on my newsfeed I thought it was satire. Unfortunately for everyone in the world, it is an actual news story. serving fast food to people is now "racist"
Remember when ESPN was a sports network? It was kind of around the time that MTV was a music network. Nowadays, as the world becomes more and more insane, ESPN - a sports channel (the "S" stands for "sports") is now doing political commentary... badly. 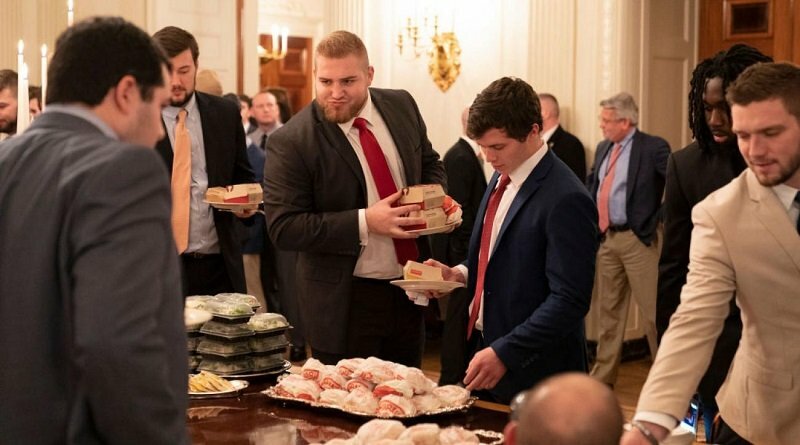 In a recent segment for "First Take," a show that I, and most other people have never heard of and don't watch, a panel of 4 people thought it would be a good idea to dedicate a bunch of time to talking about Trump serving fast food to the Clemson Tigers' football team. This is such an absolutely ridiculous statement and this is coming from the mouths of people who are meant to be professionals in journalism. It would be one thing if this was a random tweet from some dude on Twitter, but this is from a network who is supposed to specialize in reporting on sports. If I turn on a sports network (and trust me, i don't) I would imagine I would be tuning in to hear / read / see things about sports; not this garbage. Tucker Carlson has taken to referring to ESPN needing to change the meaning of their letters to "Endless Stupid Political Nagging." It will be interesting to see the backlash of this. For me, if i was in charge of ESPN, I would be doing everything I could to not encourage any part of the diminishing viewership to boycott my channel. This was a very stupid move on their part, and I would imagine this is only going to have disastrous results for the network.